Why aren’t mortgages MORE expensive? In looking at any product or service you will often hear people mention ‘supply and demand’, it is one of the foundations of Microeconomics. Generally if supply increases prices drop, if it decreases prices rise. By how much is a question of how elastic the demand is versus supply. We know from our day to day experience that there is still a high level of demand for mortgage finance, charting our figures back to 2005 has shown us that if we take out ‘noise’ of m/o/m figures that demand is still at relatively high levels. However, we also know, from our daily interactions with banks that criteria is getting harder, conditions more restrictive, underwriting is more forensic, the supply of mortgages is decreasing rapidly. Using a simple chart you would get something along the lines the one below, the blue supply and demand lines show the situation at a certain point in time, we’ll say that is a year ago, the green line of supply shows the current situation – it has moved to the left because of the decrease. 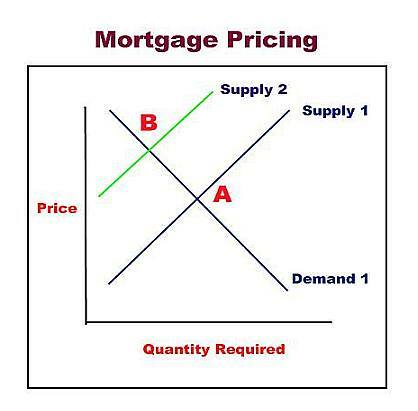 At point ‘A’ the price and quantity and price are in equilibrium, but with a sharp decline in the supply you expect point ‘B’ to become the prevailing situation, the price should rise sharply (in mortgage finance) and the quantity required would drop, what we have seen is that the quantity has dropped but corresponding price hasn’t risen anywhere near as much! Is it a case of almost perfectly elastic demand? Why haven’t margins on mortgage lending risen significantly? Actually they have,but not in direct proportion or to the size of the decrease in supply. Lending is down with many institutions (in conversations I have had with several bankers) over 50%, so one would expect a big increase in margins on the supply that did exist. As a brokerage our issue isn’t attracting clients (that used to be the main point of competition) it is getting applicants approved with banks that are not lending, the supply of mortgages available has really dropped off a cliff. This makes getting the job done twice as hard and is the justification for my addage (which I apparently use too often these days) ‘we have to work twice as hard for half as much’. The only reason margins have not spiked is because banks have recieved money from the state and the ones that haven’t are competing on LTV’s primarily which allow them to give their prices margin haricuts. In the future though, it is highly likely that margins on lending will increase, there is no reason for banks to pass on further rate cuts and indeed, lowering mortgage rates isn’t the means of increasing your capital base, attracting depositors is, and to pay depositors you have to make your money somewhere so we are probably going to see a flip in attitude soon (current deposit rates only exist because banks are capital hungry), where deposit prices hit the floor and margins double.